Hopefully the official reveal is only weeks away. A couple of weeks ago we all but confirmed Ford is working on a supercharged 5.2-liter V8 “Predator” engine for its upcoming 2019 Mustang Shelby GT500. A single image of that engine, though with few to no details, was leaked thanks to the folks at Mustang6g.com. Today, that same source has revealed what appears to be two CAD diagrams of the Predator V8 that comes directly from Ford itself. Mustang6G has a forum member who somehow snagged the images. So, what’s there to see this time? First off, this is not just any ordinary supercharged 5.2-liter V8. 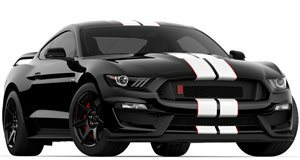 The forum member, upon closer inspection, realized the 2019 GT500 V8 engine, as per the website, “was mistakenly used when creating these diagrams as the wiring harness in the images is incorrect. It appears as though the images have a GT350 wiring harness slapped on top of the GT500 engine as you can see the wiring going through the supercharger intercooler in a few places while the throttle position sensor connector is floating in space.” One last thing to take note of: that Cobra emblem embossed on the engine cover, which we first noticed earlier this month, is also on these CAD images. This does not exist on the GT350’s V8. Ford has managed to keep things relatively quiet regarding the Mustang Shelby GT500, which will likely (though not confirmed) debut at Detroit in just a few shorts weeks. We’ve already heard this all-powerful Mustang will produce 680 hp and 630 lb-ft of torque. The GT350, just to compare, has 526 hp and 429 lb-ft of torque. We also nearly killed ourselves in the process, but what fun is life without risks? Can’t say the neighbors miss those flat-plane crank cold starts though.